Dry October, What About November? Now that we are ending the month of October, we can reflect on the precipitation totals for the month, which were upped significantly after the rainfall we received today. However, we still ended the month drier than average with a total of 2.02" of rain in Rockford. That total is over six tenths of an inch below average for the month. So, while we ended drier than average, the rain we received on Halloween was very beneficial and allowed the month to avoid being even drier. Now, where do we head from here? The month of November is looking wetter than average through at least the first half of the month, according to the Climate Prediction Center. 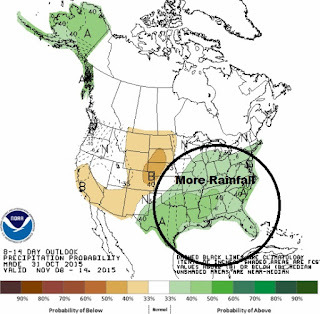 Here is their outlook for the next 8-14 days (the first seven days are looking average in terms of precipitation). The Stateline falls in the light green shade, which indicates a 33-40% chance of seeing above average precipitation during the middle of the month of November. As of now, it looks as though a system will move through between the 12th and 14th, and that could give the region a decent rainfall, which is probably what the Climate Prediction Center is looking at when suggesting we could see above average rainfall during this period. Getting into a wet pattern is something we could benefit from here because we are below normal for the year in terms of rainfall. Therefore, if this prediction comes to fruition, it would be a positive for the Stateline. Rainy Halloween, But Then What? It has been quiet chilly and dreary across the region lately, and that pattern looks to continue at least for one more day. That normally would be good news, right? Well, in this case it may not be since that one day happens to be Halloween. A system will move into the region from the south tonight and the moisture will stick around throughout the day on Saturday, meaning a wet Halloween is in store for the Stateline. The rain will likely be the steadiest from sunrise through the early afternoon hours before becoming slightly more scattered in nature and lighter as well later in the afternoon and early evening. Will every location within the 0.50"+ shade see at least a half inch of rainfall? No. But if you reside in that shade of green, a likely rainfall total will be near or slightly more than a half of an inch. The rain will end for everyone late on Halloween evening as we clear out into Sunday. That will be the beginning of a very nice pattern change for the Stateline as sunshine is in the forecast Sunday through Wednesday with a significant warming trend in store as well. Take a look at where the temperatures go after Halloween. We will see 60's on Sunday and Monday with the potential for 70's on Tuesday and Wednesday before a storm system moves in late in the week that will drop our temperatures back down into the 60's for Thursday, and 50's for Friday. With a stretch of days like this, the term "Indian Summer" can be used, which is essentially a stretch of above normal temperatures that occurs after the first hard freeze of the season, which we already received. 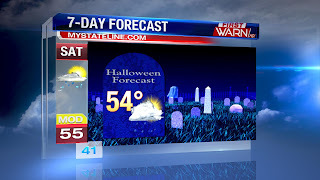 Now that we're on the eve of Halloween, we have a much better outlook on how the day will shape up! Unfortunately, there is going to be rain for most of the day Saturday. A low pressure system to the southwest, is currently producing heavy rain and severe storms for portions of Texas. This system then tracks east across the U.S today and tonight. With this, warm and moist air advects - or is transported - into northern Illinois and southern Wisconsin tonight through Saturday. As a trough and a wave of energy move into the region, rain will form just ahead of it. Rain will move in very late tonight or early Saturday morning. Most of the rain will fall early and midday Saturday with help from the strong upper level south west jet. The jet ( or jet stream) is a column of fast moving air, and we call them our steering winds. So this jet will funnel the moisture overhead and brings enough lift in the atmosphere for some rain. Overall, it looks like we will see about 0.25" of rain. Rain will then begin to move out in the late afternoon, and early evening from west to the east. This is good news for some, as rain looks to be ending for Trick or Treat time. Any lingering rain will be on the lighter side, but you'll still want to keep the umbrella handy! It may be good news for some. For others, you may just be ready for the cold and snow. But if you're looking for that during the month of November, you may just be out of luck. Let's first start with the temperature outlook for November. This comes from the Climate Prediction Center and was produced earlier in October. If this outlook holds true, the Northern Plains and Midwest would have a higher likelihood for above average temperatures. Now, does this mean 70's all the time? No. Because the average high during the month drops through the 50's and 40's, but temperatures would still be warmer. And it looks like the first few days of the month will not disappoint. Following a chilly Thursday afternoon, highs after Halloween will climb to the 60's for Sunday, November 1st, and then into the 70's for the 2nd through the 4th. Looking into the extended forecast shows a few dips here and there, but no prolonged period of cold. At least within the first couple of weeks of November. Why are we going to see this type of pattern change? Well, we have to look at what's going on in other parts of the world. Everything across the globe is connected in weather. Patterns in Asia affect what happens in the U.S. It's like the Chaos Theory - a butterfly flaps its wings in Africa and a tornado forms in Oklahoma. Everything in weather is connected. So to understand why our temperatures will warm next week, we have to look out west...to the Pacific. The Pacific hurricane season has been fairly active, but we're now in a period of suppressed activity. This ultimately has an impact on our jet stream pattern. 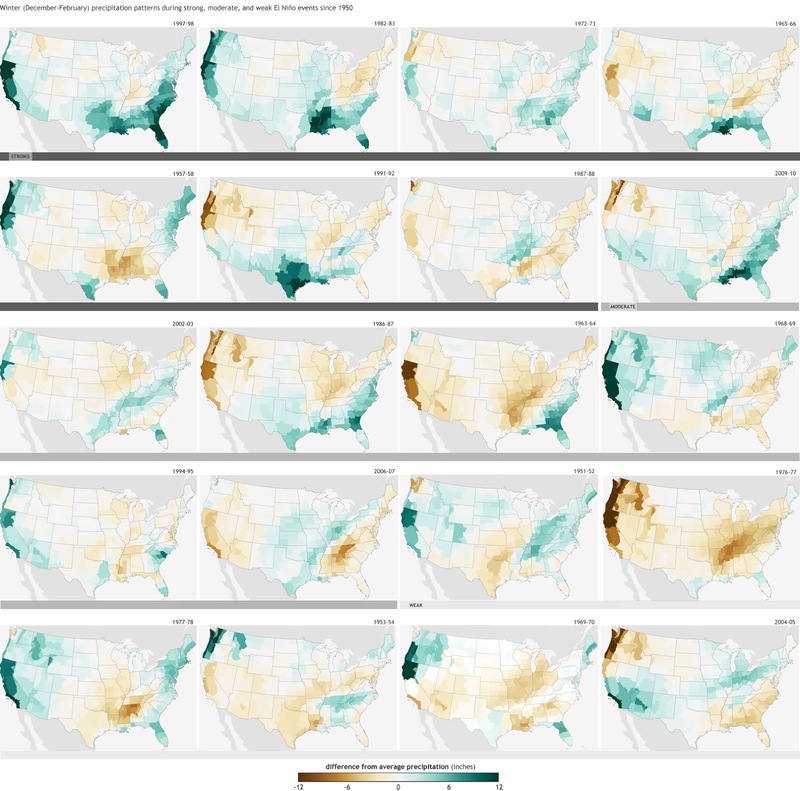 We all know what El Niño and La Niña are, but what about other atmospheric patterns. One in particular is the Pacific/North American pattern. According to the Climate Prediction Center, the Pacific/North American teleconnection pattern is one of the most prominent modes of low-frequency variability in the Northern Hemisphere extratropics. This pattern has a positive and negative phase, and is in reference to heights in the mid-levels of the atmosphere. Even though this pattern is something that naturally occurs, it is also influenced by ENSO (El Niño Southern Oscillation). The positive phase of the PNA pattern is often associated with El Niño, while the negative phase is more so associated with La Niña. What's happening out west is the PNA pattern has turned slightly negative. This means mid-level heights will be rising in the Gulf of Alaska producing a ridge of high pressure. This in turn causes the jet stream to buckle down the west coast, while forcing warm air into the middle and eastern part of the country. Interesting, considering we're supposed to be entering into a strong El Niño pattern. Even more interesting is that during past strong El Niño events, November has typically ended up below average! During the '97/98 winter, when we had the strongest El Niño on record - the month of November was almost 7 degrees below average for Rockford. During the '82/83 El Niño, November was nearly 2 degrees below average. Opposite of what's expected this November. So it's almost as if we've entered into more of a La Niña pattern. Now, looking at the data we're pretty confident that's not going to happen as Pacific waters near the Equator remain very warm. But it's interesting to take note and remind us that there is no 'typical' pattern when we are talking about weather. After a gloomy couple of days, we trade in most of the rain for chilly temperatures. An incoming cold front Wednesday afternoon will keep a chance for light scattered showers into the evening. However, you will really notice the influx of cold air by Wednesday night. The cold front will bring in a cold Canadian air mass and temperatures will fall through the late afternoon. Overnight lows will fall into the mid 30's but with strong winds behind the front, it will feel even colder. Wind chill values will make it feel like the low 20's by 6am Thursday morning. As multiple waves of energy rotate around the low pressure system, scattered showers will be possible Wednesday night into Thursday. But with cold air in place, and even colder air in the upper levels of the atmosphere where temperatures will be below freezing, flurries are also possible too. Good news is, we aren't going to see any accumulating snow fall, that will stay farther north. Portions of northern Wisconsin, Michigan, and Minnesota could pick up a couple inches. It will be all rain Tuesday evening and Tuesday night, but as colder air moves in by Wednesday night it's not out of the question that a few snowflakes could fly into Thursday morning. Temperatures Tuesday night will remain mild as dew points values rise from the mid 40's from earlier Tuesday afternoon into the low 50's overnight. This will keep overnight lows in the low 50's. Highs Wednesday will be reached during the first half of the day ahead of a cold front. Once the front passes, temperatures below freezing move in roughly 5,000ft above the surface of the earth. It won't get that cold at the surface, but as moisture is pulled back around the front Wednesday night there is a small chance that a few flurries could mix with the light showers. Highs Wednesday will reach the upper 50's before Noon, but when you head home during the late afternoon those numbers will have fallen into the low 50's. Also, winds will greatly increase from the west during Wednesday evening, gusting 35-40 mph. Thursday will be another blustery day under mostly cloudy skies. Under the overcast sky, widely scattered showers can't be ruled out. But mixed in with those showers could be a few flurries early & ice pellets later in the day. A cloudy mild start on Tuesday, turns wet and raining in the early afternoon. An approaching low pressure system, the remnant of hurricane Patricia, will move north through the day. 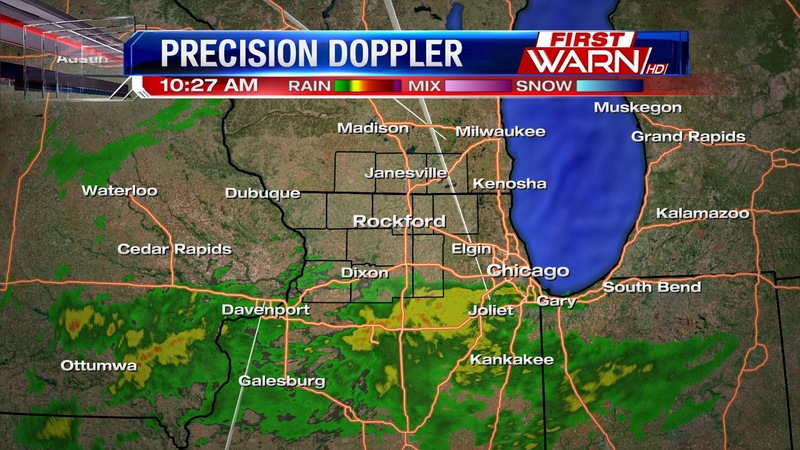 Ahead of this system, showers are already developing and moving into southern portions of the Stateline. By 11am rain will be moving into central Carroll, Ogle, and Dekalb counties, including the Sterling area. Rockford will notice the rain by lunch time, so if you were planning on going out for lunch, you'll want the umbrella on stand by. Steady rain will continue overnight and into portions of your Wednesday. With ample moisture to work with, from the Gulf of Mexico as well as remaining moisutre from hurricane Patricia, rain totals look to amount to 0.5-1.00" through Wednesday afternoon. However, a 'dry-slot' of air will develop and move into the Stateline through Wednesday afternoon. This could end the rain a little earlier, and cut back on rainfall totals. Most of the rain will be over with by late Wednesday afternoon, however behind the departing low pressure system, there could be just enough lift rotating through to fire up more lighter showers Wednesday night into Thursday morning. The fall months are known not only for the changing leaves, cooler weather and occasional snowstorm, but also for the wind. And lately it seems like we've had a lot of wind. But why? Well, we have to look at what's going on across the Northern Hemisphere. We're in what we call a 'transition' season. During the fall and spring months, the weather begins to change to either warm or cold. And it's often times during this 'transition' period that we tend to get the strong wind gusts. 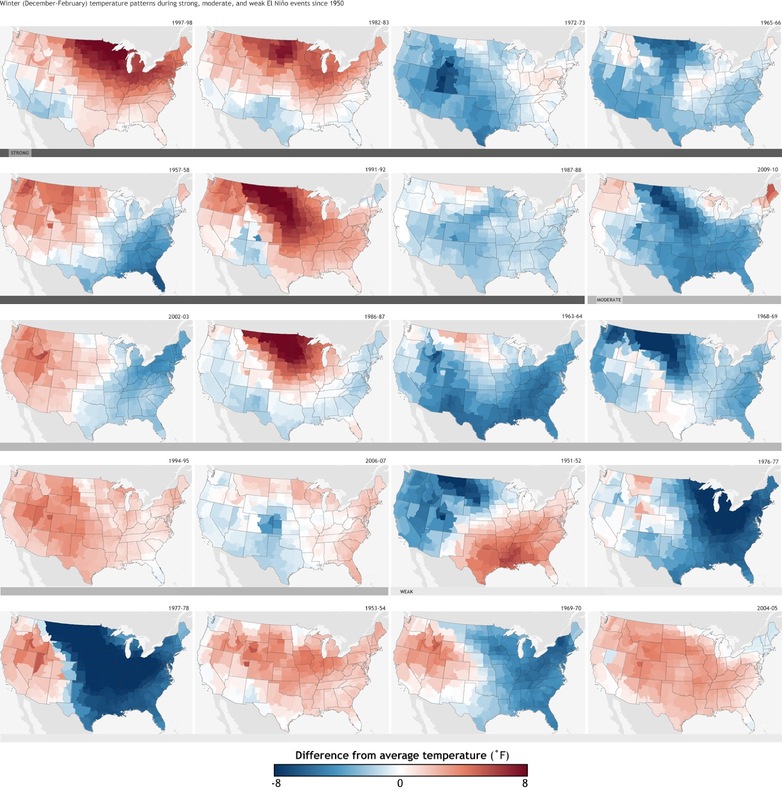 During summer, there isn't much of a temperature difference between the north and south. And the jet stream is pulled further north where the winds are not as strong. The same, to some extent, can be said for winter. Yes, the south is generally warmer, but more of North America is cold. So during these months, there really isn't much balancing the atmosphere has to try and correct for. In the spring, the warmth from the south tries to expand north, while still battling the cold. At the same time, the jet stream above is strengthening to assist in the transport of the warmer air. In the fall, the opposite happens. The stronger the difference in temperature, otherwise known as a temperature gradient, the stronger low pressure will be. Also, very strong winds within the jet stream will cause low pressure to quickly develop and strengthen at the surface. That sudden drop in pressure causes a larger pressure gradient between it, and surrounding atmospheric pressure. This causes the wind to increase. Remember, the reason for wind is because there is a difference in pressure. The greater that difference, the stronger the wind. So whenever the wind really begins to blow, you know that something is about to change. Either temperatures are going to warm up or turn cooler. In this week's case, temperatures are going to turn cooler. The jury is still out on whether it will be a washout, but rain is looking likely for Halloween. Let's just hope it occurs early enough in the day, so our ghosts and goblins stay dry Saturday night. Below is a list of the current trick-or-treat hours for Halloween. 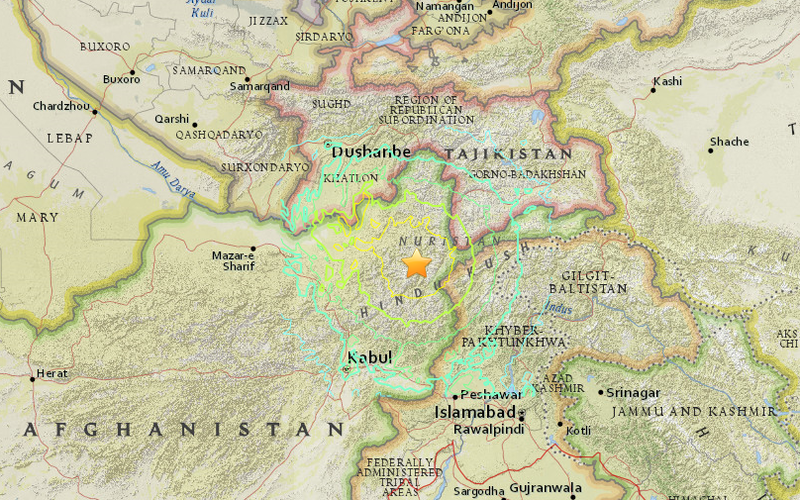 Today, a 7.5 magnitude earthquake strikes Afghanistan, at 4:05am CT, but 1:39pm in Afghanistan. The epicenter is located 158 miles north-northeast of the Capital Kabul, Afghanistan; and 28mi north of `Alaqahdari-ye Kiran wa Munjan, Afghanistan. which is issued for shaking- related fatalities. The USGS says "significant casualties are likely and the disaster is potentially widespread. Past events with this alert level have required a regional or national response." Concern is also high because of the types of structures in the area. The USGS saying, "Overall, the population in this region resides in structures that are highly vulnerable to earthquake shaking, though some resistant structures exist." Death tolls are hard to know for sure, because communications are down in many places, but it is known in the province Khyber Paktunkwa, in Pakistan, according to the provincial disaster management authority there, the death toll is up to 106, and 652 are injured. It is also known that at least 11 young girls were killed in a stampede while trying to exit their school in Takhar Province, while many others were injured, according to Dr. Abdullah. But what caused this massive quake? The USGS says its because of reverse faulting at intermediate depths. "Approximately 210 km below the Hindu Kush Range in northeastern Afghanistan. Focal mechanisms indicate rupture occurred on either a near-vertical reverse fault or a shallowly dipping thrust fault. At the latitude of the earthquake, the India subcontinent moves northward and collides with Eurasia at a velocity of about 37 mm/yr." The USGS also states that these active faults and the resulting earthquakes are the direct result of the convergence between the India and Eurasia plates. This collision is causes uplift that produces the highest mountain peaks in the world including the Himalayan, the Karakoram, the Pamir and the Hindu Kush ranges." "Earthquakes such as this event, with focal depths between 70 and 300 km, are commonly termed "intermediate-depth" earthquakes. Intermediate-depth earthquakes represent deformation within subducted lithosphere rather than at the shallow plate interfaces between subducting and overriding tectonic plates. They typically cause less damage on the ground surface above their foci than is the case with similar magnitude shallow-focus earthquakes, but large intermediate-depth earthquakes may be felt at great distance from their epicenters. 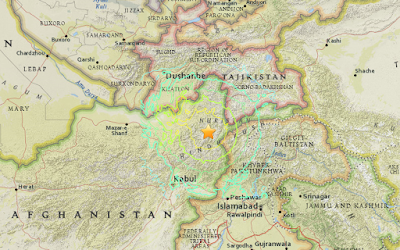 "Deep-focus" earthquakes, those with focal depths greater than 300 km, also occur beneath northeastern part of Afghanistan. 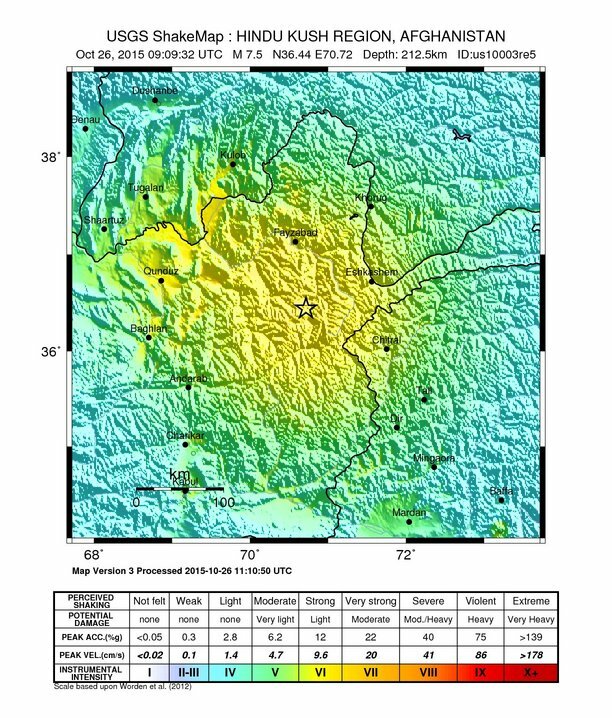 Earthquakes have been reliably located to depths of just over 300 km in this region. Seven other M 7 or greater earthquakes have occurred within 250 km of this event over the preceding century, the most recent being a M 7.4 earthquake in March 2002 just 20 km to the west of the October 26, 2015 event, and with a similar depth and thrust fault orientation. The 2002 event caused over 150 fatalities and the damage or destruction of over 400 houses in relation to an associated landslide." For more details on the earthquake click here. 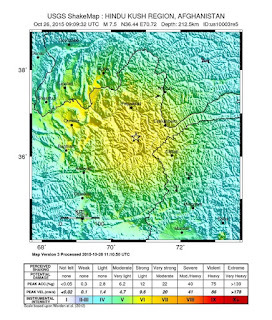 All images courtesy of USGS. It's getting to be that time of year. The time when the weather stays cold and eventually the raindrops turn into snowflakes. You knew it had to come, right? And for some in southern Wisconsin that time could be next week. Strong low pressure in the Northwest will work with the remnants of what was Category 5 Hurricane Patricia this week to bring rain to Illinois and Wisconsin as early as Tuesday afternoon. Following a very strong cold front Wednesday afternoon, temperatures will drop likely into the 40's around supper. Right now it looks like dry air will cutoff some of the rain mid-day Wednesday, but wrap around moisture following the cold front will work south through the Plains and Wisconsin. This will be at the same time an air mass, below freezing, also moves into Minnesota, Iowa and Wisconsin. A few light showers possibly mixed in with snowflakes are not totally out of the question overnight Wednesday. Will it be enough to accumulate? No. But just a reminder that November 1st is just a week away! Also following the cold front will come very strong northwest winds. Wind gusts to 40 mph can be expected Wednesday afternoon and evening. Leftover cloud cover Thursday won't do our temperatures any good with highs only climbing to the upper 40's, to right around 50 degrees. We are now less than a week away from Halloween, which is next Saturday. Halloween always seems to be a day in which the forecast can drastically change from year to year. We have seen temperatures in the 80's on Halloween, and we have seen snow on Halloween. This year looks like it will have a Halloween forecast the falls between those two extremes. As it appears now, it looks like it will be dry through the early afternoon, but some showers may be possible later in the afternoon and into the evening hours, right in time for Trick-or-Treat festivities. Now the caveat with this forecast is that between the main two long-range forecast models we use to make our forecasts, one is suggesting this rain and one keeps us entirely dry. As it looks now, I think the model suggesting some rain showers will win out. Therefore, I have included a scattered shower threat in the forecast for Halloween evening, but it does not look like a washout as of now. Temperatures will be seasonable in the lower 50's to start the evening and the upper 40's to end the Trick-or-Treating events. Now, Halloween is not the only thing happening next weekend. 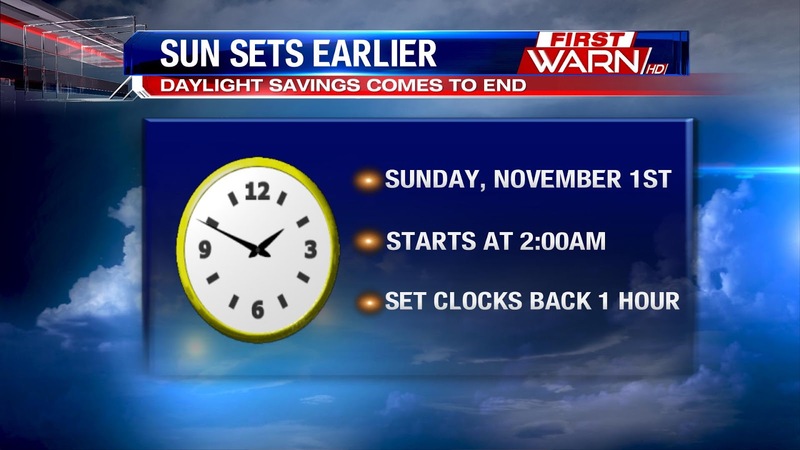 Sunday morning marks the end of Daylight Savings Time. This means we gain an hour, but that hour comes out of our daily dosage of sunlight. 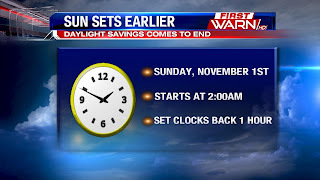 So, if you thought it was getting dark early already, get ready for sunsets to occur between five and six. 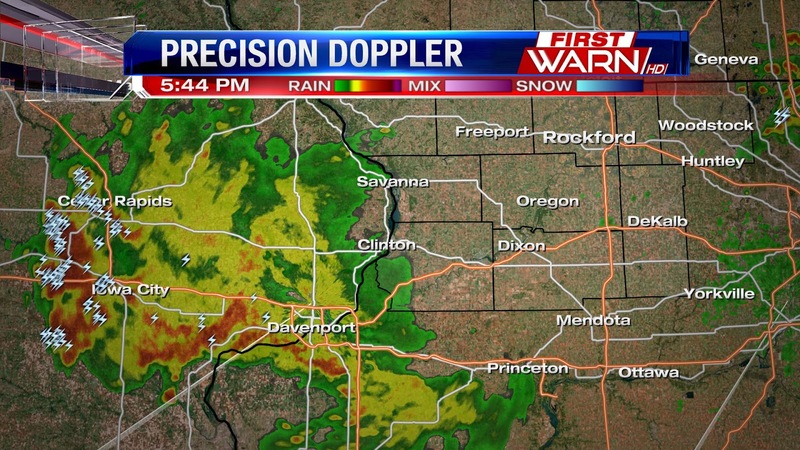 A system is bringing rain showers tonight to the Stateline, but much of that activity is already over. That will give way to a mostly dry Saturday other than some morning showers, followed by a nice and sunny Sunday and Monday. Temperatures will be cooler through the weekend and into next week ahead of our next significant system that will move into the Stateline Tuesday and Wednesday. Previously, the forecast models were having a difficult time determining when this system would move in, but now they are beginning to align a little more. Therefore, we are more confident that the rain will fall on Tuesday and Wednesday as opposed to a possibly 3-day stretch. This system will include remnants from the current major Hurricane Patricia that is making landfall along the Mexican Coast. Those remnants will move into Gulf of Mexico and then move back inland around the Louisiana-Texas border. After that, the system will move back northward towards the Stateline and fuse with a system over the Plains. This will bring a cold front and low pressure system through the region on Tuesday into Wednesday, and could give us a decent soaking. That system and its cold front will swing through Wednesday afternoon/evening, bringing an end to the rainfall. But there will be a change in temperatures following the passage of that frontal boundary. Thursday will only be in the upper 40's with lows Thursday night falling into the middle 30's. 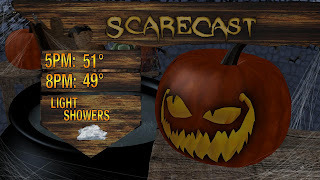 At this time, Halloween looks chilly in the lower 50's with rain possible by the time Trick or Treating comes around. We will continue to fine tune that forecast as Halloween approaches. Hurricane Patricia is now breaking records! As stated earlier on the blog, Hurricane Patricia grew from a Tropical Storm to a Category 5 Hurricane in 30 hours! Overnight, Patricia has strengthen even more, with max sustained winds up to an unprecedented 200mph! Along with extreme winds, the pressure of this system has dropped to an extreme 880mb. Hurricane Patricia is now the strongest hurricane ever recorded in the Western Hemisphere and has recorded the lowest pressure ever for a hurricane! This is a power house storm! The old record low pressure was 882 milibars, that was set by Wilma almost exactly 10 years ago. At 4a.m. the eye of the storm was about 160 miles south-south west of Manzanillo, Mexico and is moving north-northwest at 12mph. Hurricane Patricia is forecast to make landfall near Puerto Vallarta as an intense and catastrophic Category 5 hurricane that is capable of causing widespread destruction. Now residents have to rush to prepare for what will most likely be the strongest hurricane ever to make landfall on Mexico's Pacific Coast. We've been hearing it now for the past several months as signals continue to point to a strong El Niño for the 2015/2016 winter season. And with the latest winter outlook recently released from the Climate Prediction Center, it shouldn't come as any surprise that the 3 month forecast period for December, January and February call for a likelihood of above average temperatures and below average precipitation. Good news for those who don't like the cold and snow, but possibly bad news for those who need the snow for business. But before we celebrate and write off winter completely, it's important to look at what past El Niño events have brought to northern Illinois and southern Wisconsin. While the overall trend would imply a milder and drier winter, the graphic below shows that even during strong El Niño events, colder air tends to win out. 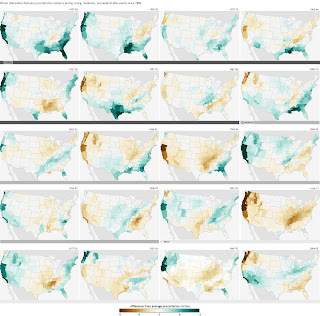 These graphics are provided by Climate.gov, and break down strong, moderate and weak El Niño events and just what the winter months produced. The strongest El Niño on record, so far, was the winter of '97/'98. Temperatures were much warmer than average, but precipitation was near average to slightly above. But what I also want to point out that even during strong El Niño events, northern Illinois and southern Wisconsin experienced cooler than average temperatures, breaking the warmer trend. The same can be said for precipitation. Notice that even during strong El Niño events, some years recorded above average precipitation. The important factor to take away from this is that while yes, the trend for this winter to be slightly above average with below average precipitation can be expected, it shouldn't be treated as the absolute. One really cold month or one major snow storm could skew the numbers and overall winter outlook. One word: WOW! What was once Tropical Storm Patricia just a short 24 hours ago, is now a Category 5 hurricane with maximum sustained winds of 160 mph. Hurricane Patricia continues to churn in the Pacific along the western coast of Mexico. Current forecast track from the National Hurricane Center has Patricia shifting northeast and making Landfall north of Manzanillo, Mexico as a major hurricane Friday night. Below is the technical forecast discussion (10pm Thursday Night) from the National Hurricane Center. This is a very serious situation! Significant flash flooding and mud slides are very possible into the weekend. previous NHC prediction, updated for the higher initial wind speed. terrain and dissipate by 48 hours over the Sierra Madre mountains. better reflect the latest consensus guidance. the warning area overnight or early Friday. Grab the umbrella before heading out to the football games Friday night because it will be a soggy one. Skies will start cloudy Friday morning as low pressure lifts northeast out of the Plains. After Noon, the rain chance will increase from west to east over northern Illinois and southern Wisconsin, with the heaviest expected into the evening. Instability remains low, but a few rumbles of thunder can't be ruled out - possibly delaying some of the games. After a cloudy start Saturday, skies will begin to clear but the wind picks up from the north. Highs this weekend will warm into the low 60's, very seasonable for late October. We have been seeing much warmer than normal weather across the Stateline this week with 70's for everyone. Those warm temperatures have been courtesy of warm southwesterly winds ushering in warmer than average air. However, it is unusual to string together an extended stretch of days with temperatures that far above normal in October as cold air continues to battle the warm air left over from summer. This week will obey that as the 70's are now over with a cold front moving through the region this evening. That front will knock the temperatures back down into the middle 60's to end the week, but those temperatures are still above normal. For this time of the month, our average high is roughly 60F, so while it will be cooler to end the week, it will not be that bad. A second system will move in Friday afternoon and Friday night, and it will bring more rainfall to the region. We could see a quarter of an inch of rain or slightly more from that system, which will continue to help alleviate the very dry conditions we've seen this month thus far. That system will drop our temperatures back to normal for Sunday before lower 60's return to begin next week. Then, we get a third system that will move in for next Tuesday and Wednesday. This is going to bring much more rain with it as totals could eclipse the one inch mark. More importantly, even colder air will filter in behind that cold front for late next week and Halloween weekend. As it looks now, highs could be stuck in the lower 50's and possibly even the upper 40's to end next week with overnight lows in the 30's and potentially upper 20's. So we enter an active pattern after seeing a rather quiet and stagnant pattern thus far this month. Back to the Future Forecast! As I'm sure you've heard; today is the day that Marty McFly travels back to the future and arrives, October 21st at 3:55pm. As the DeLorean is arriving, I thought it would be helpful that Marty has a forecast in case he makes a stop in Rockford! At 3:55 temperatures will have warmed into the mid 70's with breezy southerly winds in place. There will be more clouds than sun, but we will still see some sunshine today! However, ahead of an approaching cold front, a wave of energy will pass across the Stateline. This extra lift in the atmosphere should be just enough for scattered showers, as well as a rumble or two of thunder, to form. However, not everyone will see the rainfall. That cold front will pass tonight, giving us an isolated shower chance. Cold air will filter in dropping temperatures into the 40's by tomorrow morning. 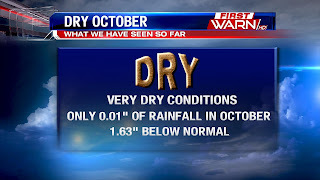 In previous posts we talked about the lack of rain through the month of October, and with the rain yesterday our monthly total has now been upped to 0.21". However, we're still about an inch an a half below where we should be for the month. 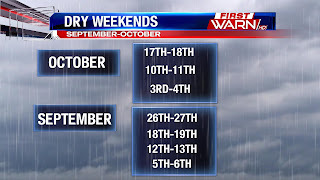 Along with the lack of monthly rainfall, our weekends have also been dry; we've been lacking a good soaking rain over our weekends for the past couple months. 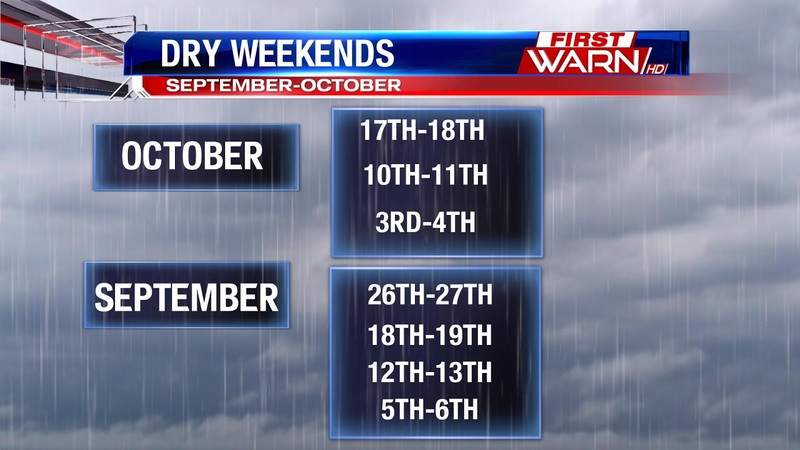 For the first three weekends of October and throughout all of September we've lacked those heavy downpours -that's a total of 7 weekends! We have to flip the the calendar all the way back to August 28th to see a good soaking. That Saturday, the 28th, we received about an inch and a half of rain. If we got that much rain this weekend we would be able to end the month right at average in terms of the rain, however its not likely we will see that much rain Friday when more rain moves through. 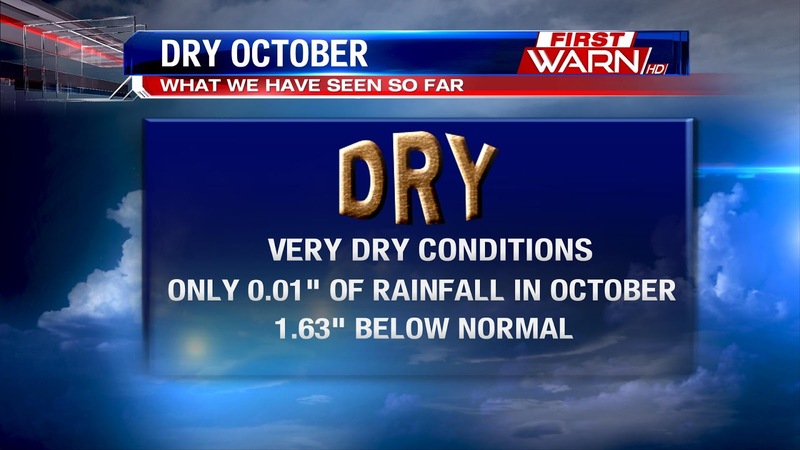 If you've been wondering if October has seemed abnormally dry, you are completely correct. In fact, it has been very dry. We have officially seen one one-hundredth of an inch of rainfall thus far this month, which is well below average. 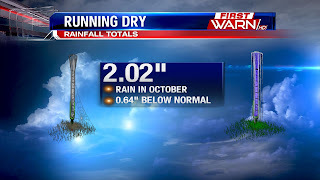 Typically by October 20th, we have received 1.64" of rainfall, so we are quite a bit below normal in the rainfall department here in Rockford. 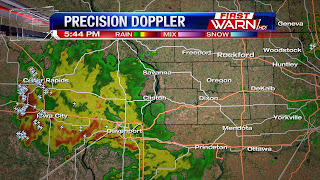 This batch of rain and embedded thunderstorms is moving east northeast, which takes it right through the Stateline, especially south of US 20. Any rain that falls with this system will be very beneficial as the soils are extremely dry. So, despite the forecast rain totals not being too impressive, it will help with the very dry conditions that we have out there. As it looks now, the heaviest rain will fall from Rockford and points to the south as the core of the heavy rain will likely travel in that general direction. Locations in the teal shade could receive upwards of three tenths of an inch of rain before it ends later tonight. Other areas will likely see less, but nonetheless, any rain we can squeeze out of this system will help significantly. Rainfall this month has been running short, so far only recieving 0.01" of an inch, leaving us with a rain deficit of 1.63" inches. There are some rain chances this weekend, however we have to wait until Friday night to see some measurable rainfall. Currently a stalled frontal boundary is set up in central Wisconsin, this was responsible for some light showers moving through the area. As an upper level wave of energy passes through later today this could be just enough lift to see a few light showers pass through the area, however not a lot of rain will fall. 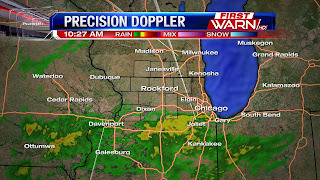 Best chance for rain look to be right along the Illinois and Wisconsin border. As a short wave trough, or dip in the jet stream passes overhead tonight, this will give us the best chance for scattered showers to pass through. A cold front will pass Wednesday night, ahead of that there is an isolated chance for a shower or two. But there still isn't much moisture to work with, and only about 0.10-025" of rain is expected. It was a very warm day across the Stateline with temperatures reaching the middle and even upper 70's. Those warm temperatures were brought to us by strong southwesterly winds that gusted upwards of 40mph earlier this afternoon. Those winds will continue tonight and that will hold our temperatures into the middle 50's as opposed to the 40's we saw Monday morning. This pattern will continue to hold true through Wednesday afternoon. That is because we will remain in the warm sector of an approaching cold front that will finally reach the region by Wednesday afternoon. As long as we remain in the warm sector of the system, we will get southerly winds and see warm temperatures. So we keep those 70's through Wednesday before that system finally reaches us and brings some rain showers Tuesday night into Wednesday morning. The showers will not bring the colder weather, though. It will be the actual front that brings in that colder weather, and that will not move through until late Wednesday afternoon. That is why, despite Tuesday night's rain showers, Wednesday will be another warm day. On the image above you can see the front well off to the west. That is what will bring those much needed rain showers Tuesday night. I say much needed because thus far in October we've only picked up one one-hundredth of an inch of rainfall. That is far below the average through October 19th. When you combine the dryness with dry soils, strong winds, and low relative humidity values, you get an elevated fire danger. That explains the Red Flag Warning earlier today that has now expired. However, just because it has been allowed to expire does not mean the fire danger is gone. Until we receive some beneficial rainfall Tuesday night, the fire risk will be above normal. Once the front moves through Wednesday afternoon, that risk should recede, especially in areas that pick up any of that rain. Overall, I do expect most of the region to see some shower activity, although this event does not look significant at this time. Another windy day today - but warm too! High pressure that was centered overhead over the weekend has now moved east over west Virginia. Low pressure builds across the northern Plains and is moving to the east. The Stateline currently sits in between these two systems creating a strong pressure gradient, or difference in pressure. The greater the difference the stronger the wind gusts will be. Today winds will gust up to about 35mph with sustained winds near 15-25mph. This also is contributing to the heightened fire threat today. The strength of the winds will diminish a bit this evening and into tomorrow, but will still gust up to about 25mph. High pressure builds closer to us by Thursday. 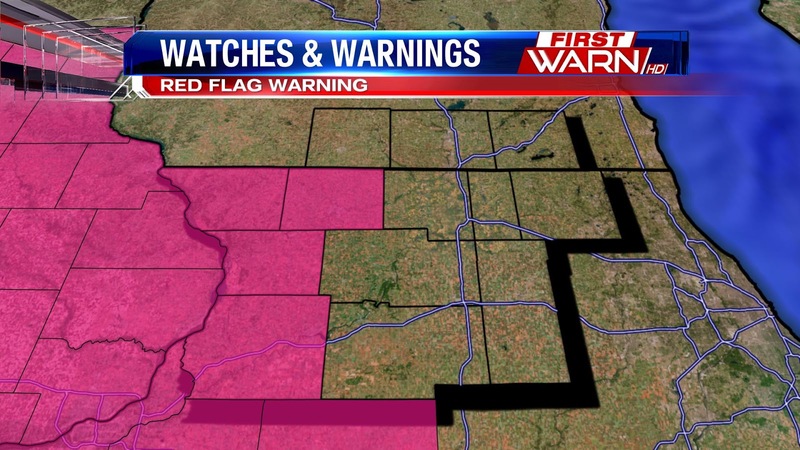 Monday morning update: The Red Flag Warning has now been expanded across all of northern Illinois. A Red Flag Warning means there is a high fire danger, and that burning of any kind is highly discouraged. Farm equipment, cigarette butts, among other things could create a spark and allow for a quick ignition of flames. High fire danger occurs when you have very dry soil (about 8%), low relative humidity (25%) and strong southerly winds all combine to create the heightened fire threat. The warning will go into effect at 10am and will last until 7pm when winds will lighten a bit. The National Weather Service has issued a RED FLAG WARNING for Stephenson, Jo Daviess, Carroll, and Whiteside Counties from 10am through 7pm on Monday with extreme fire conditions likely. This advisory is issued when there is an "extreme fire danger" due to dry weather, windy conditions, long stretches of dry weather, and dry soil. With the recent dry stretch and lack of rainfall, the windy conditions expected Monday afternoon will result in an elevated fire risk for the western portions of the Stateline. Therefore, outdoor burning is highly discouraged in the counties outlined in pink above. However, just because your county is not highlighted in pink does not mean there is not an elevated fire risk. It would not surprise me to see some more of the region be put under a Red Flag Warning before Monday afternoon gets here as high winds are expected across the entire area tomorrow. With the winds expected to gust upwards of 30-40mph, any spark that ignites into a fire will spread rapidly and be difficult to put out. If you must work with any sort of flammable substance or fire tomorrow, make sure to take extra precautions. Last night we had a FREEZE WARNING for the entire region because temperatures fell into the upper 20's and lower 30's. Temperatures actually did end up falling below freezing this morning across the Stateline. 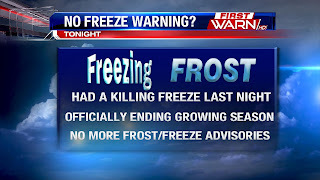 That led the National Weather Service to saying that the growing season is officially over as the freeze was labeled a killing freeze, which is technically when an area experiences at least two consecutive hours of temperatures at our below 30 degrees. This occurred last night for the entire area. Once the NWS states that the growing season is over, there is no longer a need to issue frost/freeze weather advisories. The only caveat to that is if the first freeze occurs prior to November 1st. If the season's first freeze occurs before November 1st, and then a period of warm weather occurs, the National Weather Service has the option to issue frost/freeze advisories when the next freeze event happens. Therefore, with the anticipated much warmer temperatures this week and for the foreseeable future, we may see frost/freeze advisories utilized again when we see freezing temperatures move back into the Stateline. After tonight's freezing temperatures, I do not foresee any temperatures in the 30's for the next week and beyond. 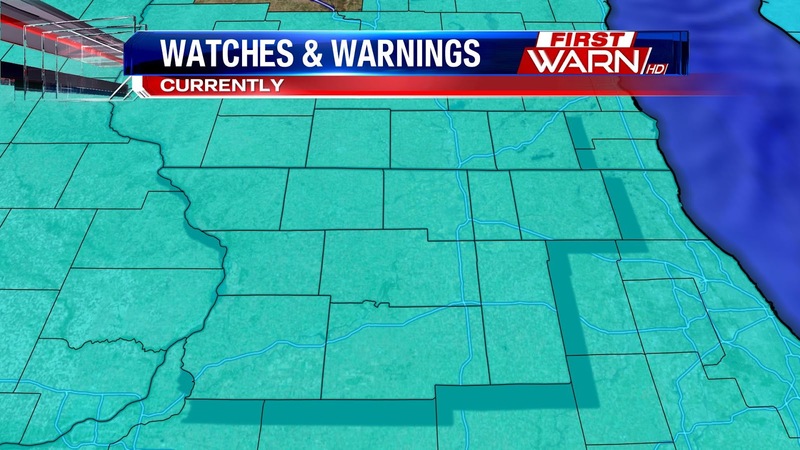 For the first time this season, we have a FREEZE WARNING in place for the Stateline, which includes everyone in the region. This was issued because temperatures are expected to fall into the upper 20's tonight, which means a freeze will occur, one that will kill tender crops and vegetation. So, if you want to protect those plants that are sensitive to cold, make sure to cover them or bring them indoors tonight. With clear skies and winds subsiding overnight, there will also be a widespread frost tonight. This is not always the case. Typically frost is associated with freeze events, but frost requires clear skies and calm winds, in addition to cold temperatures. That is why sometimes you get frost events when no freeze advisories are out because temperatures in the lower and middle 30's can support frost formation, so a freeze is not necessary. The frost and freezing temperatures will be out of here by 9am tomorrow morning. Temperatures will not warm much, though, on Saturday. High temperatures will likely only make it into the lower 50's despite the expected abundant sunshine. Another freeze event with widespread frost is expected Saturday night into Sunday morning with temperatures again expected in the upper 20's area-wide. Then, a warm up moves in. Cold high pressure that sits over the region now will slide to the east, which puts us in the southerly and southwesterly winds next week. That means unseasonably warm air moves into the region for Monday through Wednesday. It looks as though highs will reach the 70's for three straight days, and that will be a good 10 degrees or more above average. So we continue to ride the temperature roller coaster this October and continue with the above average October in terms of temperatures. Thursday Evening Update: The Freeze Watch has been extended to include all northern Illinois and southern Wisconsin counties. Remember to bring in the plants you can and want to keep and pick any veggies left in the garden. Temperatures both nights drop into the upper 20's. A passing cold front on Thursday, along with a building high pressure system, will bring chilly temperatures to the Stateline for the weekend. As the high pressure system sinks south from Canada, it will bring a chilly Canadian air mass with it. This combined with breezy northerly winds will reinforce the cold air keeping the cold snap with us through the weekend. Overnight lows on Friday night into Saturday morning will fall below freezing, into the upper 20's. 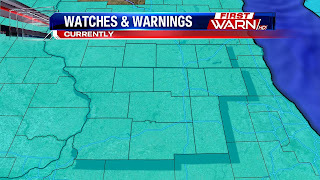 This has prompted the National Weather Service to issue a Freeze Watch for Winnebago, Boone, McHenry, Ogle, Lee, and DeKalb counties late Friday night until 9am Saturday morning. Along with the freeze watch you will also wake up to areas of frost Saturday and Sunday morning. It will still be cold as you wake up on Sunday, with temperatures near freezing at 32°. Though southern Wisconsin and our western counties aren't included in the freeze watch just yet, I wouldn't be surprised if the watch was expanded coming up later today or by Friday. The cold snap won't last long, temperatures make it into the upper 50's by Sunday afternoon and then into the mid 60's by Monday. Why So Warm Sunday, Then Cool Next Week?